Our edible forest is a permaculture forest garden. It is planted in our shadiest area which has an extremely high water table in winter and the heavy clay soil sets like concrete in summer so your average apple tree wouldn’t stand a chance. 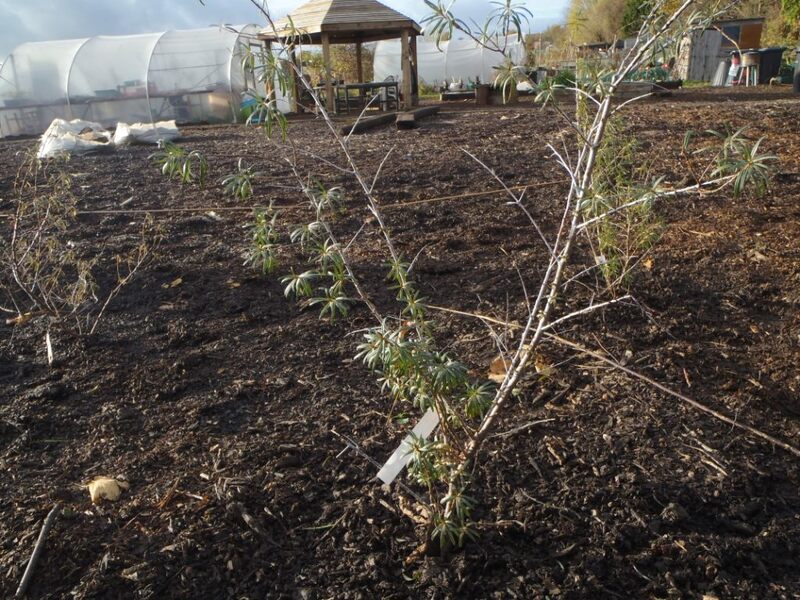 So we have planted a collection of some the worlds toughest trees and shrubs all with edible properties. There’s a wide range of plants from the abundance of the himalayan sea buckthorn -very high in vit C but mouth curdlingly tart- to the strawberry guava -which produced only 9 berries in 2014 yet each one was exquisite and as sweet and tasty as an opal fruits! The principle mimics a productive natural system. The tree layer will grow, then next shade tolerant shrubs create an understory and then ground cover plants like mint and comfrey mean no weeding. It should be an low effort maximum output food forest with food growing on all three levels, but or course trees grow slowly so we’re not there yet. We are also working to improve the soil. But come along and wonder through our collection of weird and wonderful plants – a dwarf Russian mulberry and the Siberian pea tree, chokeberries and edible honeysuckles! 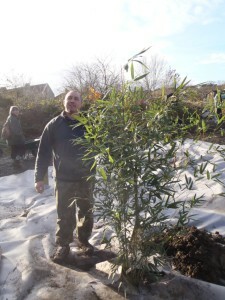 The edible forest was original designed Tim Foster and stocked by tree from Martin Crawford’s Agro-forestry research centre.